Wah ...exploring the Free Tree Society place really makes me hungry leh. Some more play with ah moi catching fishes. Papa asked wanna eat what? I said rice or something like that. "Malay, Indian or Chinese? ", asked Papa. I told him wanna eat with hand punya. 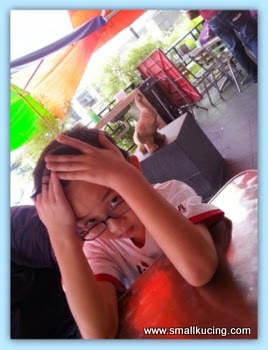 Bangsar...bangsar...hmmm.....Papa said he heard that food is nice at Devi's Corner. Must be our lucky day. Lunch time....and yet managed to get a parking spot that day. Upstairs have air-cond but we sat downstairs to keep an eye on the car. Mamarazzi was real surprised. Usually in other banana leaf rice restaurant that we went to , they only give 3-4 types of vegetables. You want acar, fried bitter gourd, fried salted chili and etc...you'll have to ask for it. But at Devi's Corner....the waiters (yup...2-3 fella came), just plonk all the goodies on to the Banana Leaf without us having to ask for it. 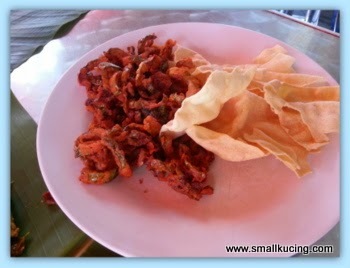 The Poppadoms and fried bitter gourd came separately in a plate. Very generous portion too. Mamarazzi asked for one type of curry only while Papa told the waiter to "campur"(mix) several type of curry on to the rice. Fuiyoh.....even with one type of curry, Mamarazzi already said spicy. But papa with so many type of curry....."raining" oh....."raining" but still nice to eat leh. Mamarazzi said the best was this. Cooked mango. Not sure how they cook it but she said it tasted delicious. She can have loads and loads of this with just rice alone leh. Am less adventurous. I took plain rice with the cucumber salad and Poppadoms. Papa said next round wanna bring Ah Kong and Ah Mah to eat here . Hopefully can find parking spot la. No that pricey too. Aiya....where is the receipt ah.....dunno Mamarazzi "sumbat" where already...If not mistaken, it was around RM19 inclusive of drinks. Ooooh...I love mango. :) I also love rice. Wish I could try it!!! I think you have many more restaurants then we do here. That makes me hungry too! Eh enuff meh you only took rice with salad and keropok.. Nvm, if not enuff can ask papa take you go eat noodles again hehe.. 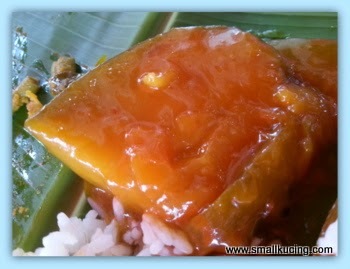 I also like banana leaf rice, usually can refill the rice and the few types of gravy/sauce/chutney.. But usually I will order fried chicken or daging or whatever also la.. Wah syiok la..
Nope...the nasi is good enough. Devi's Corner, aiyoh, macam quite familiar leh this name.. but this is not the very famous one opposite Bangsa Village hor?? that one is Nirwana something is it?? eih.. no play play lah these banana leaf rice restaurant always packed with people, sonemore parking also susah in Bangsar.. Paparazzi double-parked ke?? no wonder must sit not too far away to jaga..
That one not far away ...that is Nirvana Maju. Fuyoh!! 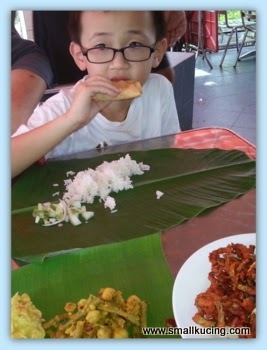 That was a big banana leaf meal. So many dishes. Now I want to have one too. cooked mango!! yuh!! that is interesting leh.. so how it tastes like?? sweet and sour and salty and spicy?? all the flavors in one huh?? wah, so nice until Mamarazzi can eat this alone many pieces with the rice only.. Uncle SK also wanna try that.. does that comes with the standard plate, or kena order separately?? what is that called?? the waiter give without we having to ask. But got to know from a friend that they don't have this dish daily. Your papa bring Ah Gong and Ah Mah go eat, you bring me go eat ok? What a delicious meal... think of parking is a headache.... but must try one day.. Think maybe need to park at bangsar village n wslk across kot? Cooked mango good ar? I prefer the original one, hehe! That is the favourite place for Anay and Letchumi to eat late dinners. The food is always fresh, nice and not cheap! But that day kira cheap lo...normal banana leaf rice at other plc already rm6/person. They have the branch of Devi's near my house which is cheap with less choice of food. The chefs are different so the standard speaks itself. Not too long ago they kena saman the outlet near my home and ordered to close for weeks! Something to do with hygiene. Wah..so tempting..I must go there again..
Wah...RM19 for 3 persons....very cheap leh...even if it's just vegetables coz got so many types! Didn't order any meat? RM19 is cheap. Err but then no meat. Didn't feel like eatinv meat that day. Moreover so many types of vege already. 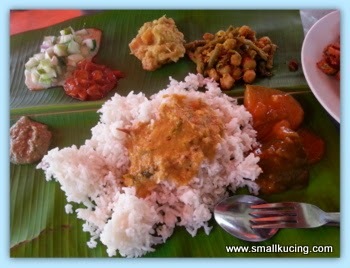 Usually banana leaf rice vege only price is around rm6/person . I love banana leaf rice! Just the nasi, kuah and vege pun already cukup kenyang. I think the cooked mango is mango chutney. I love it too. Spots on...with banana leaf rice no need meat also cukup umph.. This must be an authentic one. That's how they serve, they will give you every vegetable side dishes that they have without asking. The localized ones will save cost ma, if you don't ask then they don't give.. It has been waaayyy too long since I've had banana leaf! Ought to again but, I'm always #TeamNirwana! I like fried bitter gourd the most. And also popadom. Hehe. Eaten here before. Food okay and price okay. Only thing parking not okay. Aiyo...parking at that area is like gold. Maybe need to park inside bangsar village. Looks like you all found a really good place to eat.. That mango caught my attention.. Looks so good. I drink a mango punch drink here alot and love it. Those places not enough parking spot memang susah, park at the road side scared people scratch your car, then park far far away scared got people rompak...=.=! Mango chutney? I also like.. very appetizing one! yummsss! The cooked mango got my attention. Will go and try this place if I am around that area. Thanks for recommending it.